When building a new garage, it is imperative to consider the different options. Many people don’t give much thought to the benefits of metal garages over wooden ones, but the advantages are plentiful. 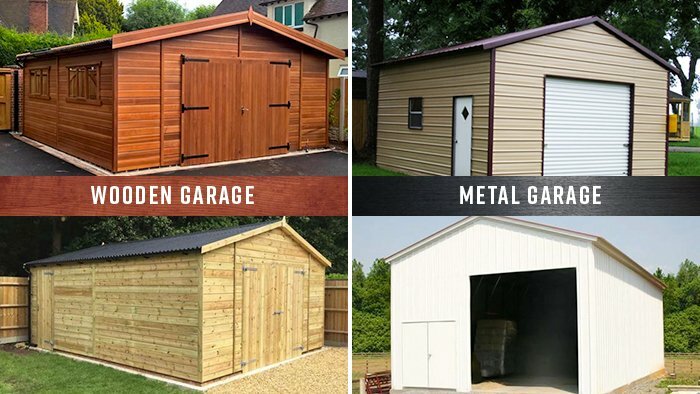 If you want to build a wood garage because of the way it looks, you’ll find it comforting to know that steel and metal are available that provide the same appearance. For now, let’s take a close look at the benefits of building a metal garage over wooden ones. The two most popular types of garages being built today are ones made out of wood or metal. Both types offer pros and cons, but when it comes to getting the most out of your investment, you will want to choose one that offers the most durability, which is going to be a metal garage. There’s no denying that wooden garages offer a very rich beauty. In fact, many people opt for a garage constructed out of wood simply because of its aesthetic appeal. They don’t consider, however, that wood doesn’t last nearly as long as metal. It’s also important to consider the cost of wood versus metal. Wood garages are going to be far more expensive than their metal alternatives. And as mentioned before, if it’s the wooden-look that you are going after, there are many metal options available on the market that mimic the look of wood garages. When it comes to construction and installation, you’re going to find far more effective with metal than you will with wood. Metal is much lighter than wood, making it easier to lift and install. This means that it will take professional less time to construct a metal garage, cutting down on the labor you have pay. If you are building the garage yourself, it’s easier to build one made out of metal, however, because it is crucial from a safety standpoint that garages be constructed the first time properly around, it highly recommended that you have a professional build it for you. Once again, as we pointed out before, metal is going to cost much less than wood. If you are trying to stick to a budget, then a There were no Copyscape matches found. The metal garage is going to be your best option. And not only do metal garages cost less to build, but they cost less to maintain. A wooden garage requires a lot of upkeep, including sanding and staining at least once every two years. Metal garages, on the other hand, which have a polyester top coat require little to no maintenance and will last much longer than wooden ones. Over time, a wood garage will likely warp and crack. There’s also a chance that it will chip and rot. Even worse is that it can become damaged by termites. You don’t have to worry about these issues with a metal garage. And while metal does have the possibility of denting and corroding, you can greatly diminish the odds of those issues arising if you invest in a garage manufactured out of high-density steel. Because metal is available in any color of your choosing, as well as with any pattern that you might prefer, metal garages are an excellent choice regardless of the exterior you are trying to complement. More so, metal garages can be painted in the future if you ever decide you want to change their color to match any changes you make to the rest of the exterior of the building. When compared to wood, metal garages are much more durable and secure. They are also easier to insulate, which keeps the inside of your garage safe from outside elements, such as rain and wind. If you’re investing in a new garage, you will want to consider the advantages of building one with metal instead of wood. A metal garage is going to be a cheaper investment yet provide far more benefits than a wooden one.